The PATHWAY® Modular Ramp System features multiple modular ramp configurations to fit unique entryway situations and offer multiple safety elements to make this the safest aluminum modular entryway mobility ramp in the industry. Whether you are in need of a modular entryway mobility ramp for a short time or long-term, the PATHWAY® Modular Ramp System is the perfect solution because it can be configured to fit any entryway situation and reconfigured for other entryways. 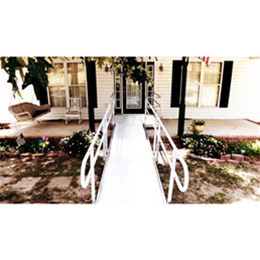 See multiple configurations by visiting the PATHWAY® Modular Ramp System photo gallery. Safety is top priority with the PATHWAY® Modular Ramp System. The PATHWAY® Modular Ramp System will not deteriorate from the outdoor elements and features a non-skid surface that maintains traction in any weather. 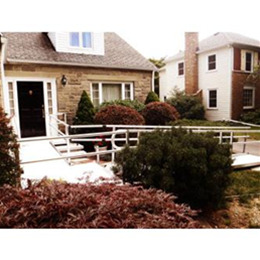 PATHWAY® Modular Ramp Systems from EZ-ACCESS® are uniquely built to transition with you, wherever life takes you. 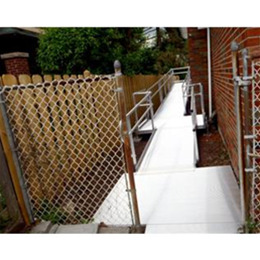 The PATHWAY® Modular Ramp System is able to be rented or reused easily with its quick setup and reconfigure design. 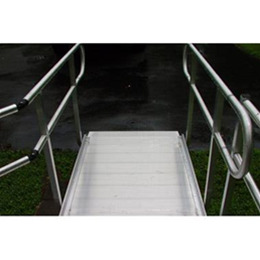 There are several additions you can make to the PATHWAY® Modular Ramp System. For additional safety features, check out the PATHWAY® Modular Ramp System's modular landing pad, modular gate and handrail loops. 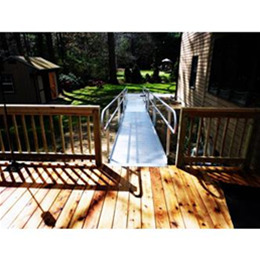 EZ-ACCESS® feels aluminum is the best material to construct mobility ramps from because of its durability in all weather, ease of reconfiguration, quick installation and ability to install without a building permit. The PATHWAY® Modular Ramp Systems are expandable, re-configurable and movable whereas wood ramps can be changed through demolition and reconstruction. Platform Standard Widths: 48", 60", 72"
Platform Standard Lengths: 48", 60", 72"
Stair Standard Lengths: 24", 36"